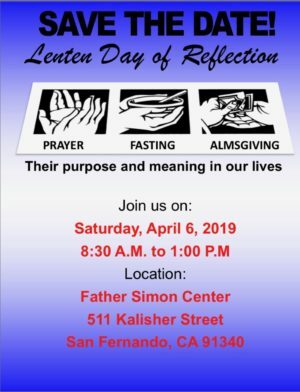 Dear ACTS Community, Join us on Saturday, April 6 2019 for a Lenten Day of Reflection at the Father Simon Center. Spend the day in community reflecting on the power of Prayer, Fasting, and Almsgiving in preparation for the great miracle of Jesus's Resurrection. We look forward to seeing you!